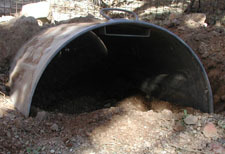 Using a 15-20 gallon metal trash can (plastic cans will collapse under the weight of the dirt), cut in half using a Sawsall, grinder or similar tool. The bottom, which can form the back of the den, can be either left intact or removed. The half trash can should be set on ground level or slightly dug in (Be careful not to create a hole/depression that will fill with water). Before adding soil, rocks can be placed around the outside of the can to help reduce erosion. 6-8" of dirt should be placed over the can to provide good insulation against extreme temperatures. The dirt will settle and should be checked several times during the first season to make sure the burrow is well protected. The trash can burrow can be very pleasing aesthetically and can be easily integrated into a natural landscape setting.